Many have asked about how we built our turned-leg coffee table and we did it by combining two great tutorials. 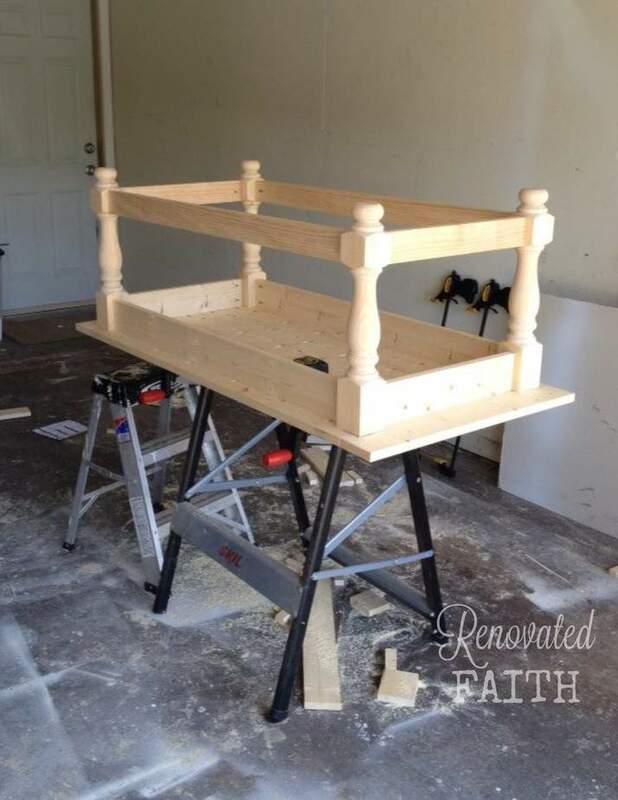 Jeremy and I first started with Ana White’s turned leg coffee table plans here. We followed everything in her plans for the top except we had a hard time getting each plank the exact length as the others. So, we added 4 inches to the cut length of each plank. Once we had the table top assembled with our mini Kreg jig, we simply cut 2 inches off each end of the constructed table top with a circular saw. This was so that our planks would all be exactly the same length. If we had this project to do over again, we would have used the Kreg Rip Cut, which can be used as a guide to get precise and straight cuts with a circular saw. We followed Ana White’s tutorial for the entire table top. Then we used these legs in pine from Osborne wood. 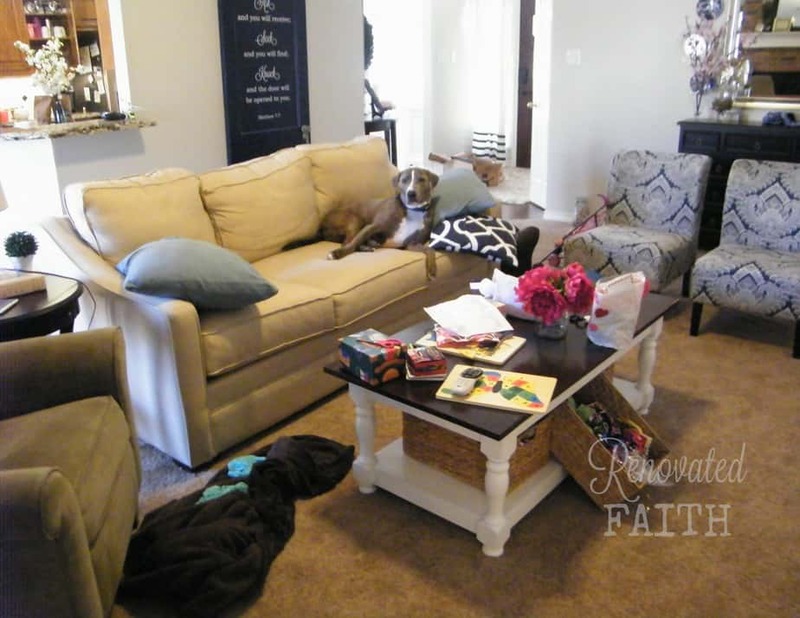 A bottom shelf was a must-have for additional toy storage, so we then adapted the shelf instructions from the Corona coffee table tutorial to our dimensions. 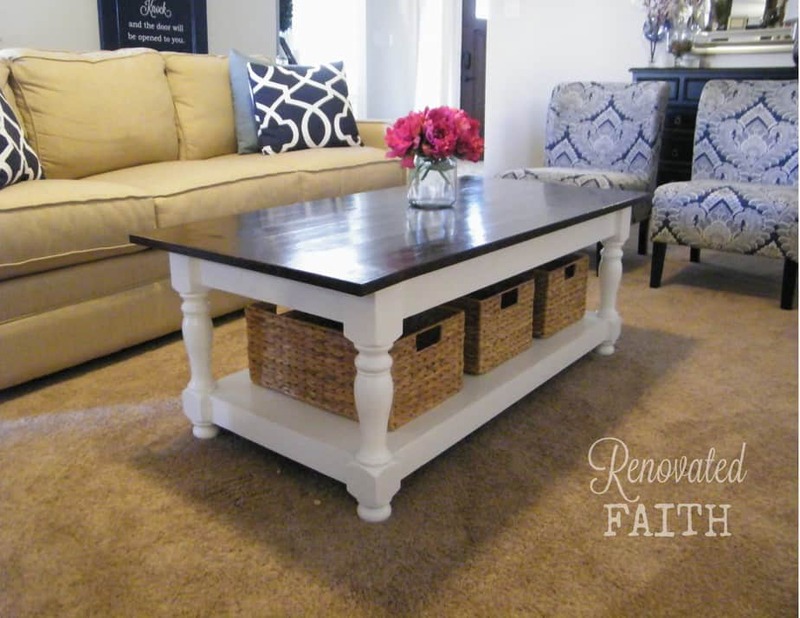 Before you knew it, we had a rectangular turned-leg coffee table with a shelf for storage! The problem with knot holes and painting something white is that they will eventually show through over time. That is why I first primed the entire table with Zinsser BIN, which can be purchased at most specialty paint stores. Use it in a well-ventilated area and use a mask or respirator. It’s pretty potent stuff. If I do another project with knot holes, I would have just primed the knot holes instead of the whole table. 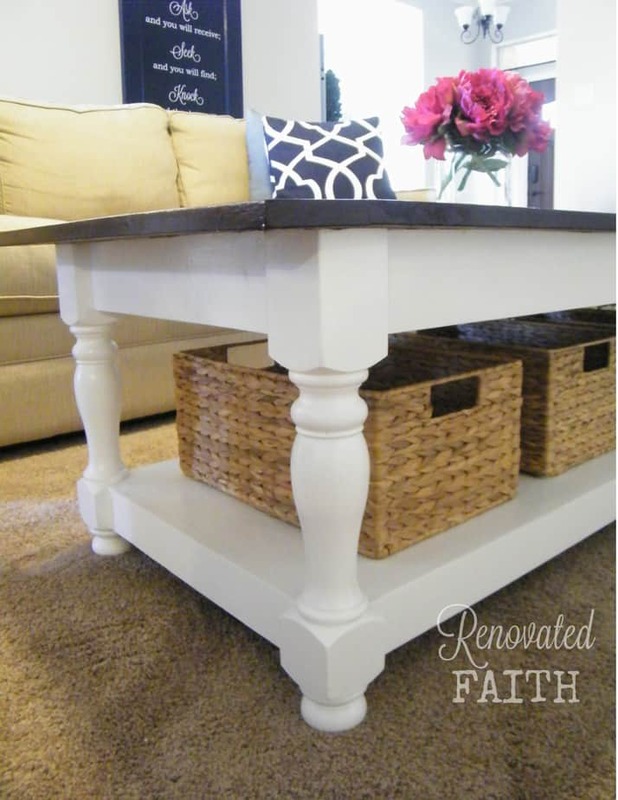 Once I primed the table, I painted the bottom in Behr Premium Plus in Satin White. For the faux stain on the top, I painted the top in a color that resembled the shade of peanut butter (Behr Warm Muffin). You want a peanut butter shade to mimic the look of wood coming through the stain. Very little will show through the gel-stain but you want what does show through to look wood, not primer. After letting the paint dry 24 hours, you paint on gel stain. I used Minwax Gel Stain in Hickory which you can buy from Home Depot. Often times, high-end furniture retailers like Pottery Barn actually use a gel-stain to refinish their pieces because often times different components of wood will have varying shades and the gel stain makes everything consistent. Gel Stain is amazing. It is a dark stain that is not very transparent so it easily hides any flaws and imperfections. 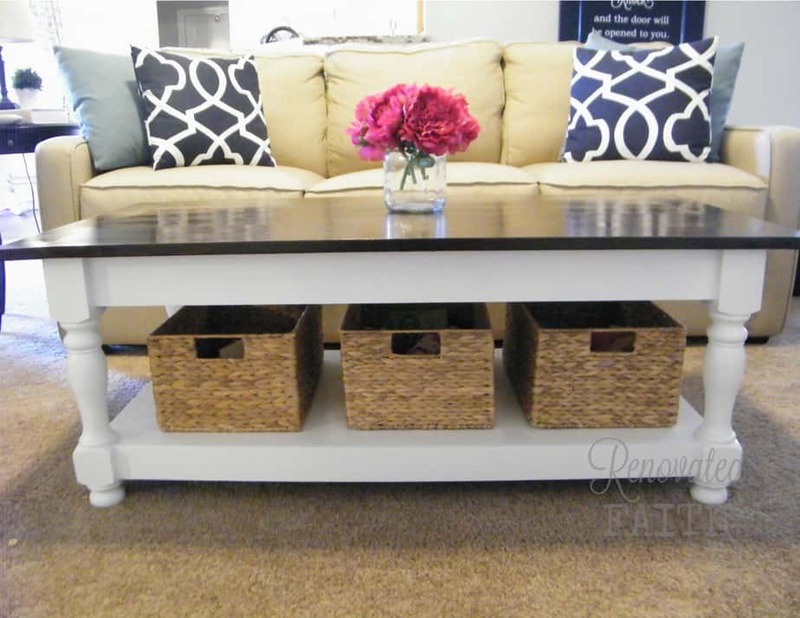 You basically paint it on and then with a dry brush, brush the table top lengthwise to get more of a wood-grain look. Gel stain also takes a while to dry so you have some time to play and get the top looking like you want. Here’s my tutorial on how to gel stain wood to help you with the process. Basically, the gel stain is very forgiving and will hide imperfections, even making low grade pine pass as a high-grade hardwood with a dark stain. I then let the gel stain dry 48 hours and then did 5 (yes, 5) coats of polyurethane with an hour between each coat. You can set glass on our coffee table for an eternity and it will not leave a ring! On the topic of transparency, I felt I should show you how my living room looks on a regular day when I am not taking pics for the blog. I actually had to stand in a pile of clean clothes on the floor to take the picture. I feel like the first coffee table picture didn’t represent how we live and who we really are. Unlike gel stain, I hope I can be as transparent as possible with my many flaws that allow God’s light to shine through. Sara Groves once said, “One of the reasons we are not free is because we are trying to be good for Jesus. We are trying to be good PR for God. I think my best PR moments are when I am weak, and He is strong in me.” I have learned that there is nothing I can do to make God look good…He’s God and He doesn’t need me or anyone to accomplish that. However, in seeking Him and submitting my life to Him, others can see Him through me even when I’m at my worst. That’s what the world needs – not false advertising for a brand of Christianity that is plastic and manufactured, but raw honesty about who God is and how He meets your every need in times of hardship. Growing up, our pastor would end every sermon by saying, “You might be the only Jesus someone sees this week so make sure they get the right story.” I want others to see God in me, not a pharisaical rendition of piety. John 15 entails the importance of abiding in Christ and by surrendering to Him for help, guidance and strength, He actually works through us. That’s the best way for others to see Christ in you. It’s vital to be transparent and honest with how you struggle because we are not called to do good things “for” God but to allow God to work through us. So much freedom comes in admitting to God that you are too weak, but through Him you are strong. This is the essence of the Christian life – God never called us to perfection, but the very reason Christ died on the cross was to make an offering of perfection on our behalf. Now, we have freedom, not to sin, but to enjoy the fullness of allowing Him to live in us, even through our flaws and shortcomings. When I am weak, He is strong. This is beautiful, Karin! thank you for your vulnerability. As I was reading instructions on painting and staining old tables, I then saw your thoughts on how God can transform ourselves just the same tucked right here inside these instructions!! Thank you for your words of inspiration. Kim, I can’t thank you enough for your encouraging words! 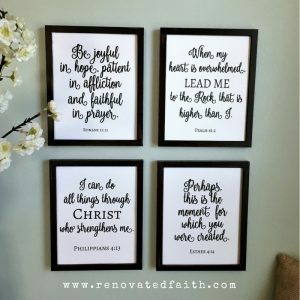 That’s exactly the purpose of this blog…my hope and prayer is that people will come to my blog looking for diy help but leave feeling encouraged to know God more. Thank you so much for taking the time to write your comment! It made my day! Please can you give marerials list and cutting dimensions of each piece? ?